Luisa Blue is the executive vice president of SEIU. Prior to this position, Luisa served on the SEIU International Executive Board Board from 2012- 2016. She has dedicated the last four decades of her life to organizing and advocating for workers’ rights through the union. As a union leader, she has been at the forefront of making racial and immigrant justice a priority for the union. Blue is one of the highest-ranking Asian Pacific Islander (API) union leaders in the nation. She believes that everyone deserves access to a better future and that we must ensure that families are not torn apart because of a broken immigration system, that everyone deserves a fair wage, and that our justice system can no longer penalize people based on the color of their skin. From serving on various committees to rallying with members, Blue continues to lead the fight for workers’ rights, civil rights and economic justice. 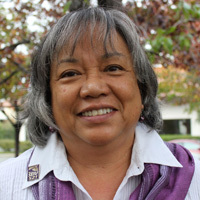 Blue was recognized in 2015 at the national Asian Pacific American Labor Alliance convention, where she was awarded the Philip Vera Cruz Organizing Award, and was recognized by the Filipina Women's Network as one of the 100 Most Influential Filipinas in the World because of her commitment to racial, immigrant and civil rights and her work at SEIU. Blue began her career with SEIU as an organizer for the SEIU Healthcare Division organizing RNs and healthcare workers throughout the United States in 1990. Four years later, Blue was asked to help lead the SEIU Nurse Alliance in its historic “safe staffing” campaign, which led to California becoming the first and only state to legislate nurse-to-patient ratio standards for acute care hospitals in the country. In 1977 when she worked as an RN at San Francisco General Hospital, Blue became a member of Local 400 and in 1982 was elected president of the Local after she helped organize a successful campaign that improved collective bargaining rights for county registered nurses. She was an outspoken advocate for compassionate care of patients with AIDS/HIV in the early 1980s, successfully campaigning for AIDS/HIV education for healthcare workers.